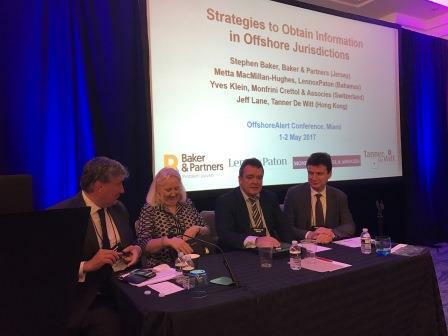 Tanner De Witt Partner Jeff Lane participated in the panel session “Strategies to Obtain Information in Offshore Jurisdictions” at the OffshoreAlert Miami Conference on Monday 1 May 2017. Sitting with him were Stephen Baker (Senior Partner, Baker & Partners, Jersey), Yves Klein (Partner, Monfrini Crettol & Associés, Switzerland) and Metta MacMillan-Hughes (Litigation Partner, Lennox Paton, Bahamas). The 15th Annual North American OffshoreAlert Conference is a Financial Intelligence & Investigations Event that brings together more than 250 clients, providers and investigators of high-end financial products and services from the UK, Europe, USA, Canada and key offshore jurisdictions to network and discuss wealth creation, preservation and recovery.